The devastating effect of DDT and related chemicals on Peregrine Falcons and many other species in the 1950s and 60s is a familiar story. DDT and its residues, accumulated through food chains, impaired reproduction, extirpated some populations, and raised the threat of species extinction. Use of DDT was effectively banned in Wisconsin in 1969, in Canada in 1970, and in the United States in 1972, making it possible for peregrine recovery work to begin. Before WW II and the widespread use of DDT, there were about 40 pairs of Peregrine Falcons in the Midwestern United States, almost all nesting on cliffs (Whether that represents an historical norm or not is open to question as peregrines, along with most other raptors, were subjected to various forms of intense human interference in previous decades). In 2003, after 30 years of recovery work in the Midwest, 128 pairs nested here, with another 33 pairs in the Lake Superior basin of Ontario. The big discrepancy, four times as many pairs today as before DDT, reflects the fact that two-thirds of the present population are nesting on man-made structures -- tall buildings, smokestacks, and bridges, most of which were not in existence before 1950 and therefore not available for the original population. Here is a brief history of this success story. Peregrines were extirpated by about 1962 over much of North America, east of the Rocky Mountains and south of the Arctic. Restoration began in the eastern states as Dr. Tom Cade and a group of peregrine admirers, mostly falconers (“The Peregrine Fund”), at Cornell University, Ithaca, New York, developed techniques for captive breeding of adult falcons and controlled release of their young. Many people doubted that captive breeding could succeed, but Cade and his colleagues were ready for the first experimental releases in the East by the mid-1970s. The first young were hacked, a falconry term for release of young of fledging age, at cliffs or towers where they could be provided with food while learning to fly and become independent. 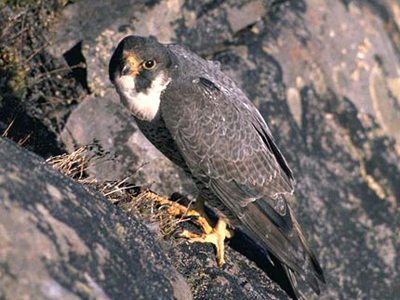 In 1976 and 1977, two experimental releases were conducted by The Peregrine Fund near Nelson, Wisconsin. Three young fledged successfully in 1976 at these sites but in 1977 Great Horned Owls killed two of the four birds released. The surviving two falcons were trapped and released again in the East, where hacking from predator-free towers along the Atlantic coast and at cliffs in northern New York and New England had proved successful. 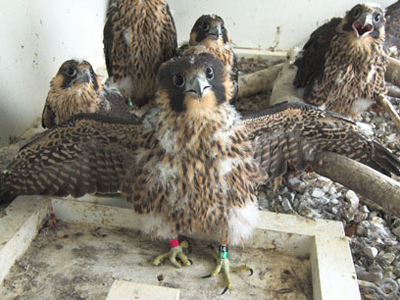 Five years with no peregrine restoration activity in the Midwest followed the abortive Nelson releases. However, in 1982, Patrick Redig, The Raptor Center, and Harrison Tordoff, Bell Museum of Natural History and Department of Ecology, Evolution, and Behavior, University of Minnesota, went ahead with releases independently of The Peregrine Fund, using young provided by private peregrine breeders, all falconers. Their first step was to contract with Lynn Oliphant, University of Saskatchewan, Saskatoon, for half of the young produced in his breeding facility in exchange for subsidizing his operating costs. The first release in Minnesota was at Weaver Dunes, near Kellogg in 1982 and continuing for the next 3 years. The State of Michigan was our first outside of Minnesota collaborator with releases in Grand Rapids in 1986, continuing for 3 years. Additional releases in Michigan occured on Isle Royale, Pictured Rocks National Lakeshore, and Trap Hills near Bergland on the Upper Peninsula, and lastly, Detroit. 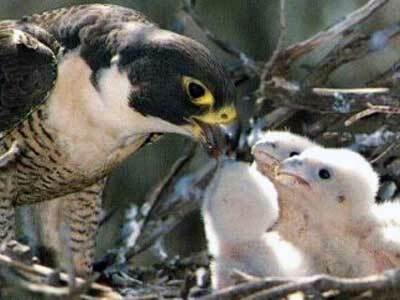 Soon peregrines from other private breeders became available for larger and larger releases. Wisconsin joined the restoration effort in 1987, followed by the rest of the Midwestern states, with Kentucky joining most recently, in 1993. Releases by the Canadian Wildlife Service started in 1981 in Manitoba and soon there after in the Lake Superior basin of Ontario, adding to the Midwestern population. Over the years, 1286 young peregrines were hacked in the Midwest. We ended releases in Minnesota in 1989, after hacking 178 young falcons and establishing several breeding pairs of adults. Other states released fewer each year, down to 4 in Missouri in 2006. However, not a year has gone by since 1981 without some peregrines being released somewhere in the Midwest. Decisions to hack or not to hack were made by each individual state. Releases in the last few years have been arranged directly by the states involved, rather than through The Raptor Center. Our early releases, 1982 through 1984, were from towers at Weaver Dunes, within sight of several historic cliff nest sites. Thirty-eight birds in all, resulting in eight nesting attempts in 1986, 1987, and 1988 on nearby river cliffs. All failed because of predation on eggs, young, or adults by owls and raccoons. We were forced to give up Weaver Dunes as a release site when adult peregrines from a nearby cliff at Alma, Wisconsin, harassed the newly released young falcons. Later releases in Minnesota were from buildings in Minneapolis and Rochester and from cliffs on the North Shore of Lake Superior. Having started hacking in the Midwest in Minnesota, Pat Redig and Bud Tordoff had contacts with the private breeders, all falconers, and decided, when other states wanted to join, to centralize buying birds to avoid having states competing for the limited number of birds. Young falcons were bought from the breeders, usually for $1500 each, shipped to The Raptor Center, checked for health, banded, and re-sold to the states. Base funding in Minnesota, about a fifth of the total, came from the Non-game Wildlife Program of the Department of Natural Resources (the “chickadee check-off”). The other four-fifths of the funding came from generous gifts from private individuals, foundations, and corporations. The Nature Conservancy and the Bell Museum of Natural History served as fiscal agents for the project. To put the cost in perspective: we hacked 178 falcons in MN, at a cost of about $2500 per bird, total $445,000. In the entire Midwest, 1,286 birds were hacked at a total cost of $3,215,000 (average cost per bird: $2500), a lot of money. By comparison, one F-16, the least expensive of modern U.S. fighter planes, cost $28,000,000 in 2001. In the whole of North America, about 7,000 peregrines were produced and hacked, for a total cost of $17,500,000. A spectacular bird that had been extirpated in much of its range was restored for less than the cost of a single fighter plane. A bargain. Because we handled all of the birds hacked in the Midwestern U.S. here in Minnesota, we were able to maintain a central database, first by Pat Redig and then re-designed by Bruce Fall and kept by Bud Tordoff. The database currently (2009) contains records of 4963 peregrines, one third hacked, two thirds produced in the wild by hacked birds or their descendants. We currently have records for 2077 peregrine nestings. Each year about 15% of nesting adults in the Midwest are unbanded. At first we thought these unbanded adults came from undiscovered pairs, but then realized that each year about 15% of the young that fledge from the nests we know about go unbanded for a variety of reasons. So we know about almost all of the pairs in the area and are able to band about 85% of their young each year. We should be able to continue the present level of coverage well into the future. What has emerged is a well-documented story of a population of peregrines that started at zero and now is close to carrying capacity, nesting on a variety of sites: cliffs, smokestacks, buildings, and bridges. Many historic cliff nesting sites have been reoccupied, such as along the North shore of Lake Superior and the Mississippi River valley. In 2007, there were 226 known pairs of peregrines on territories in the Midwest, 163 pairs succeeded in fledging 443 young. Productivity of young in the Midwest matches healthy populations elsewhere in the world. Life is good for Midwestern peregrines. The database we have maintained makes it possible to answer questions about peregrine population biology -- such topics as survival of adults and young, dispersal from nest structures, effect of fledge site on choice of nest site, fate of the different subspecies released, comparison of hacked birds with wild birds, and much more. It also creates a baseline of information to which we can compare and measure the health of future Peregrine populations in the Midwest. Across the continent, this has been a hugely successful effort led by The Peregrine Fund (now moved to Boise, Idaho, and gone on to many other projects, California Condors, Aplomado Falcons, Indian vultures, and more); carried out with the initiative, money, labor, and dedication of private citizens and individuals from universities and colleges, foundations, corporations, and state and federal agencies. It is now eight years since the Peregrine Falcon was taken off the Federal list of endangered species. For making peregrine restoration successful, we thank all of you who gave to the MN DNR Non Game Program and other similar programs in other states, gave money directly to peregrine restoration, helped with falcon releases, kept track of what the falcons were doing, read leg bands, and simply thrilled to see these fine birds once more. A community conservation effort to be proud of!